Anxiety disorders are all 100% treatable. They are well understood and there is a whole range of different techniques you can use to overcome any anxiety problems. The table below is very basic but it will give you an idea as to where you should direct your efforts to get the appropriate help that you may need. Fear is essential to human survival. Anxiety attacks and other forms of anxiety are behaviors that have developed from inappropriate fear of particular situations. These reactions then become generalized and can be triggered at the wrong times. Research has shown that genes can be a factor in anxiety. Some people have a genetic predisposition which is then often triggered by some stressful life event. This event appears to change how the brain deals with fear. An enormous number of people are affected every year by anxiety. Anxiety disorders are the most common mental illness in the United States. 19 million (13%) of the adult U.S. population (ages 18-54) are affected. We have put together a fully comprehensive ebook that shows you exactly what you need to do to eliminate anxiety and improve your health. Sign up for our free quarterly magazine 'The Anxiety Cure' and you can download this book completely free. Learn how take away the power of a panic attack and eventually eliminate them altogether. Train yourself to focus on uplifting and happy thoughts and prevent negative thinking. Start to take risks again and try new things in your life. Escape from the old patterns of obsessive worrying. Develop a positive outlook for the future. Discover a powerful supportive voice in your mind when you think. You will discover new ways of directing your thoughts away from your social worries and develop more confident ways of behaving in social situations. You will find yourself thinking about how other people feel rather than focusing too much on your own feelings. The therapy sessions on this CD are designed to help you to think differently in all social situations and build social confidence. They are designed to be listened to over and over, allowing your own imagination to explore new psychological possibilities. 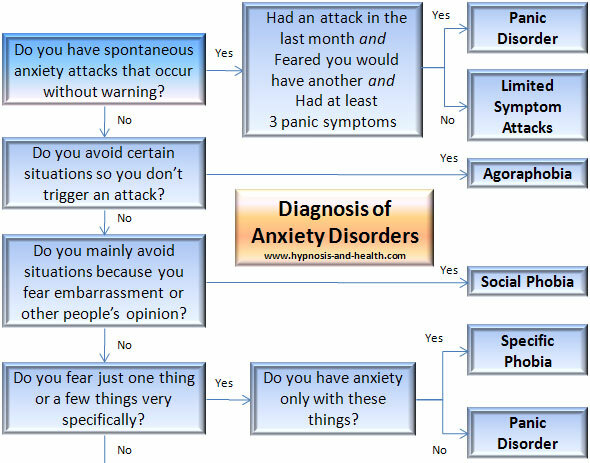 What Type Of Anxiety Disorder Is Troubling You? The first step in getting well is to stop thinking you're sick, to stop feeding your fears. Stop talking about it. This includes friends, family and unnecessary trips to your doctor or therapist. Stop reading about it and researching it. Many of the long term anxiety sufferers that I see at one of the clinics have read everything there is to read on the subject, they are experts in their field. The net result is nothing. They are still in the same state of anxiety and in many cases getting worse. Constantly reminding yourself about your anxiety increases its importance in your mind and keeps the whole cycle repeating over and over. Stop thinking about the past problem. Again, you are reminding yourself of your condition and damaging your own confidence and self esteem. Start focusing on the future and getting well. Anxiety	Hypnosis – cognitive behaviour techniques work very well under hypnosis. 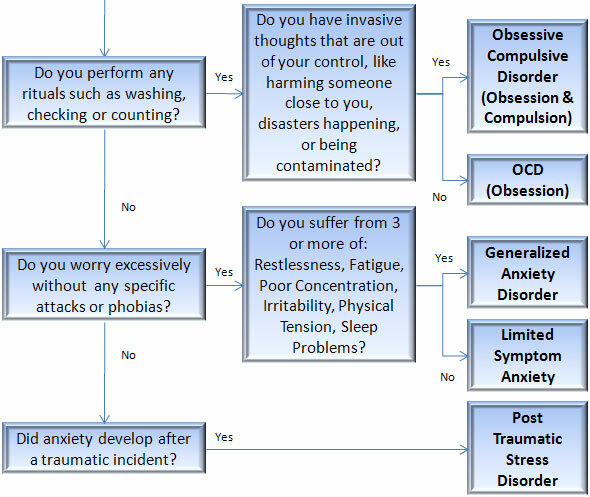 Exposure Therapy or Flooding – recreating the symptoms to familiarize yourself with them. Deliberate changes in daily habits and lifestyle. Anxiety is not a mental illness or a disability, it is a state of mind that can be permanently eliminated with some simple changes in your daily life. What I would like to say to you is that the cause of your anxiety is not part of the treatment. It helps that you understand how it happened because it is always good to have reasons; it is important to know that you are not mentally ill, but a victim of circumstances. Having treated many anxiety sufferers I honestly believe that treating the cause rarely works, while treating the condition, as it is right now, wins every time. You stop panic attacks with simple changes to the way you deal with them when they happen. You stop social phobias by building up some very straightforward patterns of thinking. The more you stack all of these simple techniques the more they build up day by day, week by week. You can dismantle agoraphobia in the same way that it started; piece by piece. It is the combined effect of all the little changes that you make in the way you think and lead your life that will eliminate anxiety. Many sufferers of social phobia can point to something that made their condition worse, often family, parents, bullying, an illness, perhaps just a lingering feeling of something too far back to remember. Anyone living with anxiety long enough knows that you start to get depressed because it just seems to never end. Sure, some days are better than others, but there is that feeling that it is some downward spiral, with no way out. Then there are days where there is just some dark cloud hanging over you. Any improvement, however small brings hope. Depression will fade away as you introduce small, simple changes into your life and your hopes and expectations grow. Have you ever been to a zoo and watched a tiger pacing relentlessly back and forwards? Obsessions grow out of frustration and despair. If you suffer from any type of anxiety then you are probably doing the same thing in your mind; continually going over and over the same thoughts and worries. If you are so caught up in the moment then you can begin to act these out and they can grow into uncontrolled movements, even whole rituals. Over the years I have watched my friends do strange little movements in off guard moments. It seems that thoughts and fantasies leak out into some physical action in nearly everyone. All you are doing is magnifying a normal tendancy into something out of all proportion. You can learn to control your thoughts and then you will find that your body will follow. If you wanted to build physical strength you would exercise your muscles. Trying to stop obsessive behavior with mental force only builds it up. Relaxing and letting your mind become calm, then learning to focus your thoughts will starve the roots of obsessive behavior. Everyone has some strange and bizarre thoughts from time to time, but mostly these thoughts are instantly dismissed. But imagine (perhaps you don’t have to) that a particular thought is so disturbing that you can’t help asking yourself where it came from, why did you have that thought. By the very act of worrying about it you pull that thought back into your mind over and over again. The real danger is that you examine it, perhaps even horrify yourself and you start to think that there is something wrong with you. Of course there is NOTHING wrong with you. All you did was to be over sensitive and start of examining something too closely and then blaming yourself. Some anxiety symptoms are born out of healthy ways of thinking and behaving that become magnified out of all proportion. It is time to shrink them down to the insignificant things they really are. Don’t blame yourself. Don’t blame anyone. Just concentrate on getting well. We are offering a revoltionary combination of very different techniques developed over the past five years at our therapy clinic in London. These techniques will fit seemlessly into your daily life - all you need to do is to set aside a little time every day to listen to one of the twelve CD sessions, do some simple exercises and change a few small details of your daily life. Anxiety is a state of mind. It can be changed. Without drugs! Thousands of people every year are recovering from all types of anxiety disorders. We offer a complete money back guarantee so you really have nothing to lose and everything to gain. Permanently stop all panic attacks in just a few short weeks. Learn how to relax quickly and deeply with a variety of hypnotic and physical techniques. Learn a proven method to deal with all of your problems effectively and at the right time. Break the cycle of negative and redundant thinking so you can concentrate on what matters. Discover how to feel comfortable not knowing all the answers. Become drug free - reduce and eventually eliminate any dependency on anxiety medications. Feel confident in public and social situations. Stop avoiding people, places and events because you were afraid. Bonus Support Package - 3 monthsonline support from a professional hypnotherapist to ensure you get a good start. Nausea, sinking feeling in the stomach. Heartbeat irregular, racing or beating strongly. Tingling sensations or numbness especially in fingers and toes. Can Be Stopped For Good! Sit back, relax and discover how easily you can drift into a deeply calm and relaxing state of mind. 40 minutes of this deep relaxation is the equivalent of several hours sleep. The combination of simple harmonic music, human heart beat, binaural tone technology and the guidance of a trained hypnotic voice will deeply relax anyone and you will find that you awake thoroughly refreshed. It has always been that way and always will; there is no time limitation. Learn how to recognise ambiguous events. Be careful of your own tendency to take everything personally and not objectively. Allow you to be comfortable not knowing something, not having to know something for certain, to tolerate ambiguity. Look forward to going to bed every night. Let your unconscious mind take back control with these powerful hypnotic sessions. Uses brainwave training technology to ensure the suggestions are delivered deep into your unconscious. You may not remember learning to sleep as a baby, but you did, successfully and it is all stored away in your mind. You can automatically refocus your thoughts so you do not lie in bed at night with your mind wandering, worrying and going in circles. You can rediscover that your sleep environment is a calm relaxing place to be. Let your unconscious mind deal with it all and fall to sleep soundly every night. What Makes This Program Different? Will It Work For Me? "Thank you so much. I'm so different around everyone now ... "
"I couldn't recommend you more, I hope your other patients find the same relief. Now I am too busy working and having a life again that I don't have time to see doctors!" "Now it's been three months I will continue on with the program no matter what ... I wanted to relocate this fall but decided that my health would come first and now am willing to give that up for a while...I am so much better, happier than I ever remember being and for the most part drug free"
"I know you emailed and asked if I would be prepared to say what I thought. Well, I am really good at that now :) For everyone reading your website page, just do it ... it takes some work, it goes so fast"
There's no risk. We are a well established, professional practice based in London. Our reputation is everything to us and we offer a full 100% money back guarantee. We have done everything in our power to put together a program that really works and we are proud of the results. 6 Months Online Support From A Professional Therapist. I'm ready to eliminate anxiety from my life forever. 6 Months Professional Online Support. I also know that I have nothing to lose, considering that you will give me a FULL REFUND if I am not satisfied at any time up to a year from today. When you click on the button below you will be transferred to secure and safe website run by a third-party processor called PayPal (visit www.PayPal.com for more information) which is the internet’s biggest bank. Look for the little lock sign in your browser that tells you that you are on a secured website. We don't even see your credit card details, so your order information is kept completely confidential. Only your credit card company accesses the information. Your order is processed immediately and you'll get a receipt of your transaction number, and your order will be dispatched within 24 hours. Click on the Buy Now button below and then select 'Continue' highlighted in blue just above the pictures of the credit cards. Please do not forget to include your full postal address including the country. Anxiety and fear are controlled in the brain by a pair of small organs at its base known as the amygdala. In anxiety disorder this responds too quickly to ordinary situations, a little like a hair trigger on a gun. The differences in fear processing may be due to the existence of two main pathways into the amygdala. A higher one through the cortex which allows for conscious reasoning and a lower one directly from the sensory relay stations of the thalamus. Associations made through the unconscious pathway are more vivid and harder to forget. It is at these deep unconscious levels that hypnosis can work to reprogram how the brain responds. If you want to read more on the research then please see the anxiety research at the National Institute of Mental Health.